Paslode's F-350S PowerMaster Plus framing nailer combines solid build quality with fantastic performance and firing strength. Although it suffers a lot by leaving out some no-brainer features, it still presents a pretty solid value. Paslode, a company known primarily for its work in framing tools and accessories, sent us two framing nailer models for our recent framing nailer shootout. One of the models was a gas-powered, cordless nailer that performed really well in the Cordless division. Keep an eye out for that review later. Today, however, we’ll look at the other model, the Paslode framing nailer (F-350S) PowerMaster Plus. Unlike the Paslode CF325Li framing nailer we reviewed back in 2012, the Paslode F-350S utilizes standard pneumatic air power. This Paslode framing nailer does come with an adjustable exhaust, but there’s a caveat here—one that will undoubtedly crop up a few times in this review. Adjusting the exhaust requires the onboard hex wrench, which, frankly, annoys us. 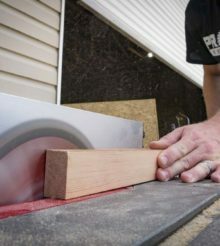 This feature comes pretty much standard on nearly all framing nailers, but a few manufacturers continue to hold out on including it. Thankfully, Paslode has done us a solid here, since the F-350S includes an adjustable hook. We prefer the reliability and durability of metal magazines over the sluggish plastic magazines that come standard on cordless models. As you’d expect, the pneumatic Paslode F-350S framing nailer can fit 2 sticks of nails (from any manufacturer) in the all-metal magazine. In an extremely questionable move, Paslode has opted to leave out convenience on the F-350S. The mode change and depth adjustment both require using the hex wrench. Neither adjustment takes a crazy long time, but requiring a hex wrench at all seems unnecessarily regressive from a design standpoint. Even more frustrating is Paslode’s firing mode change design. Rather than including a simple switch to change firing modes, the F-350S requires that the user swap out the entire trigger assembly.